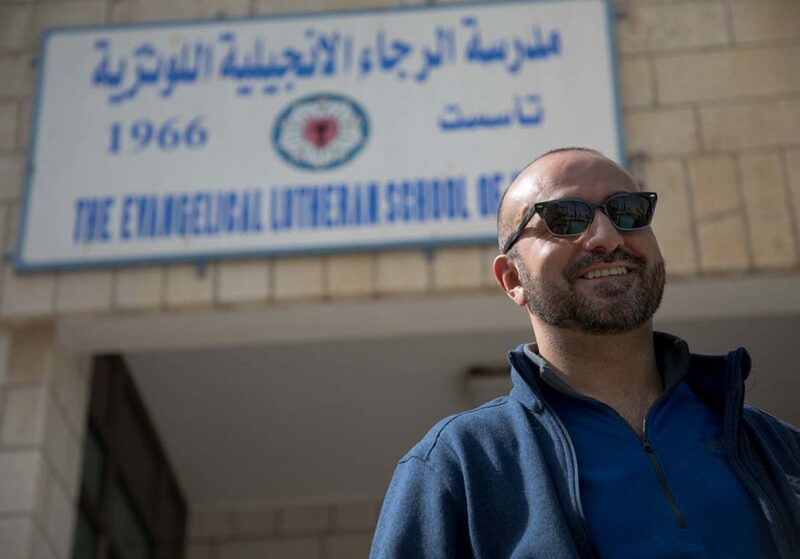 Ala, who graduated from the old Evangelical Lutheran School of Hope in Ramallah, stopped in to visit the new and old campuses of the school this past spring. Ala now works for the ELCA churchwide organization in Chicago. Editor’s note: This is the third post in a four-part series about the new Evangelical Lutheran School of Hope in Ramallah. Catching up? Read part one and part two first. To imagine the impact the expanded Evangelical Lutheran School of Hope in Ramallah campus will have, one can look back on the lives of its graduates. Of particular interest to ELCA members may be the story of Ala Rasoul, a Palestinian Muslim and 1993 graduate of Hope. After revisiting his old school in May, Rasoul had a chance to tour the new building while it was under construction. During his tour he was excited to see the location of phase two, which will be built adjacent to the main building, specifically for technology courses for secondary students and continuing education classes. A recipient of merit scholarships, Rasoul describes his religious private school education as an opportunity that helped shape the course of his life. Read the final installment of the series here at livinglutheran.org on Thursday, October 26.